In honour of how crazy hot it's been here in the South lately (and tons of other places), I thought I'd show you a neon. This colour captures very well the feeling I get when I walk out of my door and slam into a wall of blazing hot humidity. 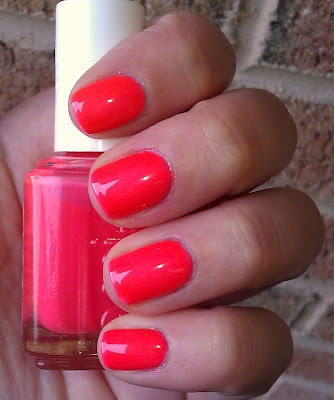 This is the only colour I picked up from the Essie Poppy Razzi (ughhhh what a name) collection. I don't wear neons on my fingers very often, but I ADORE colours like this on my toes in summer! Do you wear neons? Tell me your favourites! I love that shade! Can't wait for this collection to arrive at our drugstores. Love the neons for summer! This color is great on you! I like the purple ones. I feel too old to wear the yellows. This looks fantastic on you! @Sabine T - I think its a pretty cute little collection, even though I just got one shade! I like the small 4-piece arrangements. @michela - I was super tempted by Lights! My drugstores and Ulta still have them. @Elaine - Thank you! Neons seem really appropriate in this heat.